An electrifying thriller set in the Star Trek: The Next Generation universe from bestselling author Dean Wesley Smith. Like a strand of mutating DNA, a deadly conspiracy winds its way through the entire Alpha Quadrant, just as it stretches across several years of Starfleet history—even to the Cardassian space station that will someday be known as Deep Space Nine™. A virulent plague has stricken Terok Nor, striking down both the enslaved Bajorans and Cardassian oppressors, who blame each other for the growing epidemic. 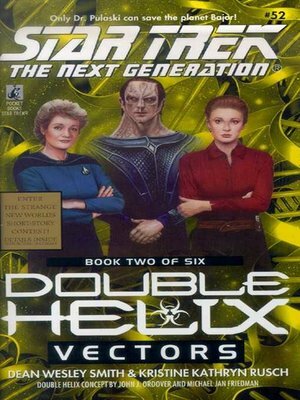 Dr. Katherine Pulaski, late of the Starship Enterprise™, must work with the tyrannical Gul Dukat, as well as a rebel spy named Kira Nerys, to discover the true source of an infection that threatens them all!